Dr Jengo's World: Ubisoft Singapore in the Spotlight! Seeing an opportunity in Singapore, Ubisoft decided to open a studio here in 2008 after the local government's interest and support for the video games industry, coupled with the quality of the education here. Since their opening, Ubisoft Singapore has worked on several of Ubisoft's projects including Ghost Recon Online and fully-developing TMNT Re-shelled. However, it was Assassin's Creed III's naval game-play that earned them the worldwide recognition. Now with naval game-play the core focus in Assassin's Creed IV, Ubisoft Singapore is now in the forefront receiving the credit they deserve. 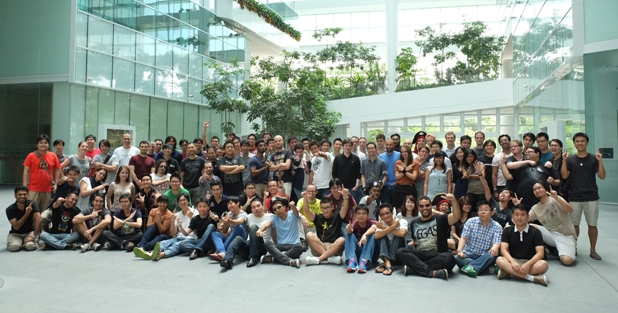 UbiBlog recently posted an article with brief details on how Ubisoft Singapore started up including the reasons on why they chose Singapore. It also tells on how all 10 of the tomb levels that they did for Assassin's Creed 2 were selected for the final game. That's not all! Escapist Magazine also visited the studio and did an video interview with several of the creative geniuses behind the awesomeness of AC IV! Split up into 4 videos, here's a behind-the-scenes look at AC IV: Black Flag! Yes, that's the same beauty who was presenting at the AC IV Panel at SDCC 2013, Andrea Rene. Edit: Looks like there are plenty more interviews done with Ubisoft Singapore. I'll keep updating as I find them. Just makes me more jealous..
All these lucky fellas! Getting to visit this studio is my dream, so hopefully with some support from all you friends, I will one day be able to do my own special interview with Ubisoft Singapore! I'm just ogling at all the cool replicas and stuff in their studio. Saw that Jackdaw Replica?! Maybe that's why they aren't inviting me... afraid I'll run all over the place grabbing everything! Lol! Hope you like this compilation, don't think anyone will be doubting the quality of this studio anymore.